Re-live the enchantment of the music from Disney’s The Beauty and the Beast on collectible blue vinyl! Featuring the songs from the live action retelling of the Disney classic, including “Be Our Guest,” “Belle” and “Something There”. 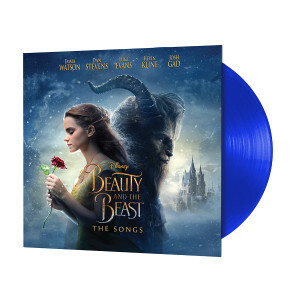 Also features new songs “Evermore” performed by Josh Groban “How Does A Moment Last Forever” performed by Celine Dion and the new duet of “Beauty and the Beast” performed by Ariana Grande and John Legend. Earn 100 Disney Movie Reward points with the purchase of this product. Disney Movie Rewards is open to legal residents of the 50 United States (and D.C.), Puerto Rico and Canada age 13+. Void in Quebec and where prohibited. For complete details and Terms and Conditions, visit DisneyMovieRewards.com.